You are here:Home Articles I have vocal nodules! Will I lose my singing voice? I have vocal nodules! Will I lose my singing voice? Years ago when I was trying to decide how I was going to make money in music—not wanting the rigors of a performing career—I came across the field of Music Therapy. That sounded like a great match for me, as I could sing and play all kinds of instruments all day long and help people while doing so! I really loved my time as a music therapist, but I ultimately decided to take a different career path. I went to graduate school to become a speech language pathologist. I knew that I still wanted to somehow combine my education in music with this field, but I wasn’t sure how. It was during my very first course in the field that I learned that speech language pathologists not only work with children and adults who have speech problems, but they also work with singers who have voice problems. Having learned this, I became even MORE intrigued with the field! Now my dreams have been realized, and I work exclusively as a voice specialist with all kinds of people who use their voices for their careers in singing, acting, teaching, and so on! When I see a singer who has been diagnosed with a voice disorder, they often say they are worried they will “lose” their ability to sing. That would be devastating! But many voice problems are temporary, and with the right treatment, a singer can recover and have a great sounding voice for the rest of their lives. In this first part of an ongoing series of blog articles discussing voice disorders and vocal health, I will focus on vocal nodules. This information can help you 1) to identify symptoms that may help you determine whether you have a voice disorder, 2) give you a better understanding of medical terminology, and 3) help you receive the care that is needed to put you on a path toward healing. And yes, the medical term is vocal folds, not vocal cords, although you may hear both terms used. The reason medical professionals call them vocal folds is that they really are NOT very cord-like. In our larynx (voice box), there are two “folds” of tissue. When we want to talk or sing, we breathe out and set these two vocal folds in motion. This is what helps create the beautiful sounds we make! Our vocal folds can vibrate 100–1,000 times per second. If we don’t give the folds time to rest, or if we are using them incorrectly (more about that later! ), they can swell. If the swelling doesn’t go away, the irritation can form into firmer growths, called nodules. Some people compare this to the way blisters form when a shoe rubs on the back of a foot, but nodules don’t grow after one night of yelling (although OTHER bumps called polyps can)—nodules develop on both vocal folds over time. Think of all you do in a day with your vocal folds: talking, singing, humming, clearing your throat, coughing, yawning, yelling (I hope not!). If these activities are done with too much force, for too long, or too often, or with improper technique, you may get nodules. Women are more likely to develop vocal nodules than men. Sorry ladies, but it’s true. As seen in a literature review on this subject (Hunter, Eric, et al., 2011), there are a few theories as to why this may be so. Women’s vocal folds are shorter than men’s, making them vibrate faster (more chances to hit each other forcefully), and they are also thinner, which makes them less able to absorb the effects of the collision. Also, women’s vocal folds have less hyaluronic acid in the outer layer of the vocal fold and less collagen, both of which are believed to have protective properties. There may also be some behavioral factors, like the fact that women frequently choose professions and activities that demand heavy voice use, such as teaching, fitness instruction, and singing. Faster vibration, thinner folds, less protection, and more voice use appear to contribute to the development of nodules in women. Sometimes it is easy to determine what causes a person’s nodules, but other times, it is not as obvious. In general, though, nodules appear to be caused by significant vocal over-use or abuse. Examples of these abusive behaviors include yelling, constant coughing, coaching or playing on a sporting field, unamplified loud speaking or singing for long periods of time, and poor singing technique. How do I know if I have nodules? In the speaking voice, people might hear a huskiness, hoarseness, strain, breathiness, and/or roughness. While singing, you might also hear roughness, breathiness, and feel strain, but you may also have a loss of high or low notes, difficulties with onsets, and problems managing the passaggio. It’s common to have a loss of the high range when you have vocal nodules. Your voice might tire easily and you may find that your voice “gives out” or that you can’t seem to make it through a rehearsal, lesson, or performance. If you have any of these symptoms for more than 5–7 days, you should contact your doctor. They may refer you to an otolaryngologist (oto = ears; laryngo = throat/larynx), or as they are commonly called, an ENT (ears, nose, and throat) doctor. It’s important that you let your doctor know that you are a singer and how important your singing voice is to your life! The otolaryngologist will ask you many questions about your voice and your medical history. They will then perform an examination and view the vocal folds to determine if there are any abnormalities. The best ways to view the vocal folds are through either laryngoscopy or laryngovideostroboscopy. During the examinations, the doctor or speech language pathologist can view your vocal folds through a very small camera attached to an endoscope (tube) that goes either into your nose or mouth. I know it sounds scary, but don’t worry; most people find the examination somewhat uncomfortable, but rarely do they find it painful. The endoscope is in place for just a few minutes. The pictures they take will give them a very good idea about what is going on with your vocal folds. This is the first step toward getting the help and treatment you need. These white, glistening vocal folds are smooth and straight and look healthy. The white bumps on the vocal fold edges are called nodules. 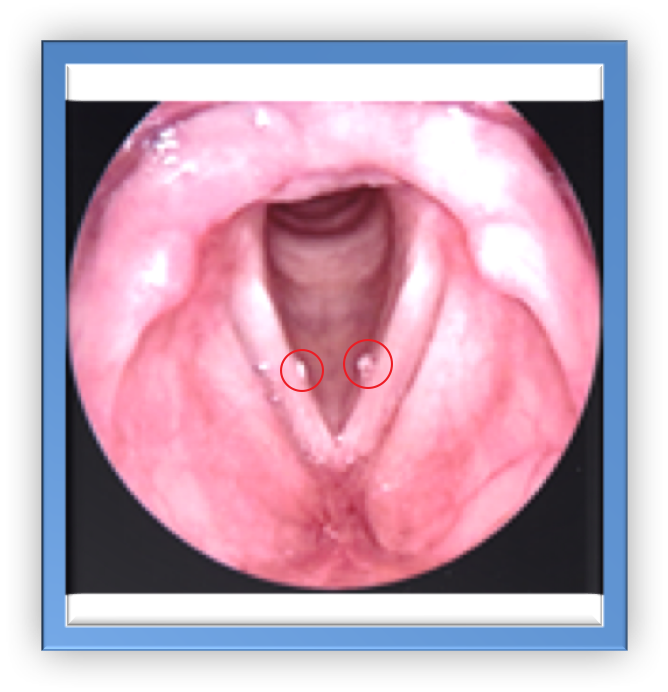 The photos above show you what is seen through the endoscope and what the vocal folds look like with and without vocal nodules. People with nodules are almost always referred to a speech language pathologist (SLP) for voice therapy. Speech language pathologists who have training in working with people who have voice disorders may also call themselves voice therapists, voice specialists, or vocologists. Not all SLP’s have experience or training to work with singers, so it is important that you try to find one who has knowledge of music and the singing voice. The SLP will evaluate your speaking and singing voice and determine the best course of treatment. One of the discussions you should have is trying to determine what behaviors may have led to the formation of the nodules. Have you started singing more often, for longer periods of time, or in a new style of music? Have you been singing without warming up your voice? Have you found yourself vocally tired and pushing through singing? Have you been talking more or over a lot of noise? The speech language pathologist will design a voice therapy treatment plan that will help the nodules to heal. Treatment may involve vocal exercises, massage, or other manual techniques to the larynx (voice box), and retraining of the speaking and singing voice. Do people get nodules from improper singing technique? Singing incorrectly can cause vocal nodules. Some signs of poor technique include feelings of itching, tickling, coughing, pain, discomfort, or muscle tension during or after singing. Your speaking voice shouldn’t be hoarse or breathy before, during, or after singing. If you sing for long periods of time, sing very high or very loud, or use a lot of belting or growling during your singing, you should especially make sure that you are using proper technique, as these behaviors will place you at greater risk for injuring your vocal folds. The Institute for Vocal Advancement (IVA) has special exercises to teach you to sing all kinds of music in a healthy way! You can also get vocal nodules from improper SPEAKING technique and yelling, screaming, or loud talking. When I see a singer in voice therapy, sometimes it is actually their speaking voice behaviors that are contributing to the voice problem. Should I stop singing if I have nodules? It’s very important that you talk with your speech pathologist and your otolaryngologist about your speaking and singing voice demands. Sometimes, people have to briefly refrain from singing or cut back on their singing schedule while they are healing. It is important that, together with your medical providers, you develop a realistic schedule for singing and performing. If you are working with a good singing teacher (like the ones in IVA), you should continue to attend your singing lessons; however, some modifications may be made to your singing exercises, practice schedule, and repertoire while your vocal folds are healing. Having the correct diagnosis from an experienced and respected otolaryngologist is key! If the diagnosis is correct, and you definitely have nodules versus other types of vocal problems, the nodules will probably heal quite well. It is very important that you seek help soon after you start experiencing problems, because if nodules get excessively firm, they will need to be removed with surgery. However, most people who receive voice therapy don’t need surgery. 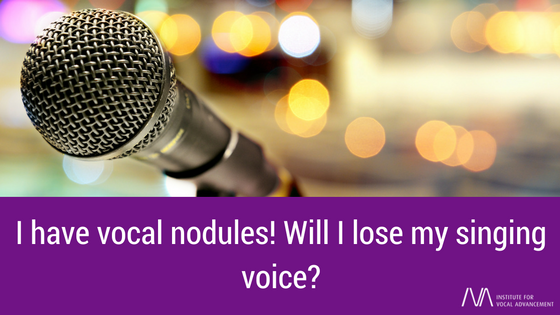 It may feel very scary or frustrating to be diagnosed with vocal nodules. Make sure you get good medical care, work with a speech language pathologist, identify what may have caused the vocal nodules, and give your body time to heal. Chances are, you will be back to singing all your favorite music and performing in a matter of time. But keep in mind that if you don’t change the behavior(s) that caused the nodules in the first place, they will likely return. Stay tuned for a future blog article where I will talk about vocal “lesions,” discuss what scientists have to say about “vocal hygiene,” and how certain things we do, eat, and drink may help us to prevent voice problems. 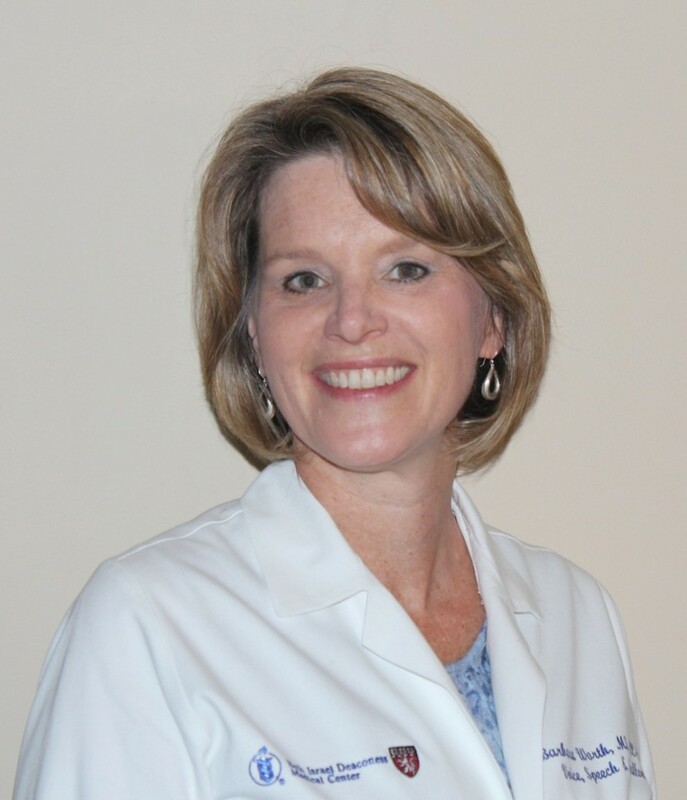 Barbara F. Worth, BM, MS CCC-SLP, is a Speech Language Pathologist and the Senior Voice Therapist at Beth Israel Deaconess Medical Center in Boston, MA. Barbara studied singing and music throughout her life and has performed solo and with small and large musical ensembles. After obtaining a bachelor’s degree in music therapy, Barbara worked as a music therapist. With more than 20 years of clinical practice in many areas of the speech language pathology field, her current specializations include the treatment of voice disorders in singers and in voice and communication modification for transgender individuals. Barbara recently conducted a webinar on vocal health for IVA (Institute for Vocal Advancement) and was an invited speaker at their 2015 conference in Anaheim, CA. Barbara is passionate about teaching and mentoring speech language pathology graduate students and singers about all things voice! Past presentations and lectures have been held at Northeastern University, New England Conservatory of Music, Westfield State College of Music, and Emerson College. When not teaching, presenting, treating voice patients, or writing blog posts, Barbara spends time enjoying her yoga practice and traveling with her family. You can find Barbara on LinkedIn. Used by Permission with written consent from the Merck Manual Professional Version (Known as the Merck Manual in the US and Canada and the MSD Manual in the rest of the world), edited by Robert Porter. Copyright 2016 by Merck Sharp & Dohme Corp., a subsidiary of Merck & Co, Inc., Kenilworth, NJ. Available at http://www.merckmanuals.com/professional. Accessed 07/22/2016. Holmberg, E.B., Hillman, R.E., Hammarberg, B., Sodersten, M., & Doyle, P. (2001). Efficacy of a behaviorally based voice therapy protocol for vocal nodules, Journal of Voice, 15 (3), 395–412. Hunter, E. J., Tanner, K., Smith, M.E. (2011). Gender differences affecting vocal health of women in vocally demanding careers. Logoped Phoniatr Vocol. Oct; 36(3):128–36. Scearce, Leda. (2016). Manual of singing voice rehabilitation. San Diego, CA: Plural Publishing. Titze, I.R. & Verdolini Abbott, K. (2012). Vocology: The science and practice of voice habilitation. Salt Lake City, UT: National Center for Voice and Speech.